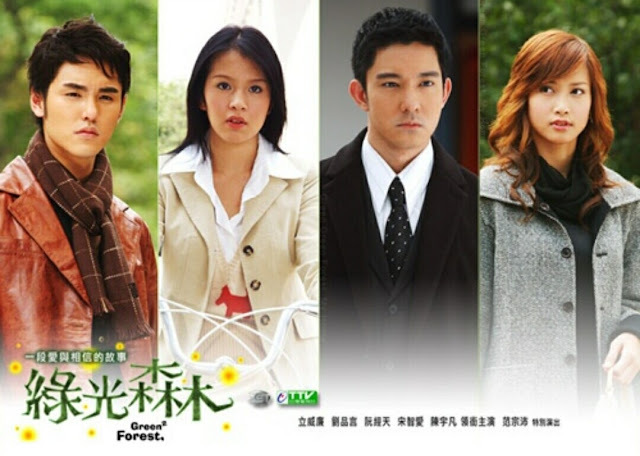 The newest show joining the list of Taiwanese dramas to be given a remake is Green Forest, My Home 绿光森林 which first aired 14 years ago (has it been that loooong) in 2005. Producers have confirmed this week that a script is already being developed and that the filming will commence soon later in the year. Before the rise of c-dramas and k-dramas in the mainstream, everyone was gaga over Taiwanese dramas which were dominating the airwaves in a lot of Asian countries after the HUGE success of Meteor Garden paved the way for more Taiwanese dramas (and boy bands - who can forget the original F4?) to be imported elsewhere. Many of us grew up with dramas such as The Prince Who Turns into A Frog, Fated to Love You and the ever popular It Started With A Kiss starring a then fuller cheeked Ariel Lin and Joe Chen being a hot topic in the school lunchroom. When news broke out about the remake of Green Forest, Esther Liu, one of the original actors in the series, fondly recalled her seventeen year old baby fat as well as how filming Green Forest deeply influenced her and also how the drama affected everyone. Leon Jay Williams who played William in the series, also reposted the announcement on his Weibo, saying that he was "deeply touched that many people still had fond memories of Green Forest". The actor also said that he's very much looking forward to the newer version of the drama. What about you, are you a fan of remakes or do you think the original versions will be better off left alone? Weigh in on the comments section below. Wow.. w're grown up in the same era. hee hee.. luv to see these dramas in remake. Hopefully they are better. I liked that Drama then but the OTP constantly bickering and misunderstanding got on my nerves. The HEA was a bit unbelievable since they didn't really grew out of it at the end. But probably they were kind of masochistic.